It is a tradition, in certain parts of the Lands of Dream, to celebrate birthdays by raising a toast to the Chelonian Hill. And like many traditions, it is both foolish and wise. The foolishness has many aspects. For one thing, the Chelonian Hill is not a hill; for another, it may no longer be found in the region where the tradition itself began. You see, what the tradition calls a hill is in fact a turtle – or tortoise, as they are sometimes called – of immense proportions. No-one knows its true origin or age, but scholars believe it wandered the world many aeons before the coming of the younger peoples. 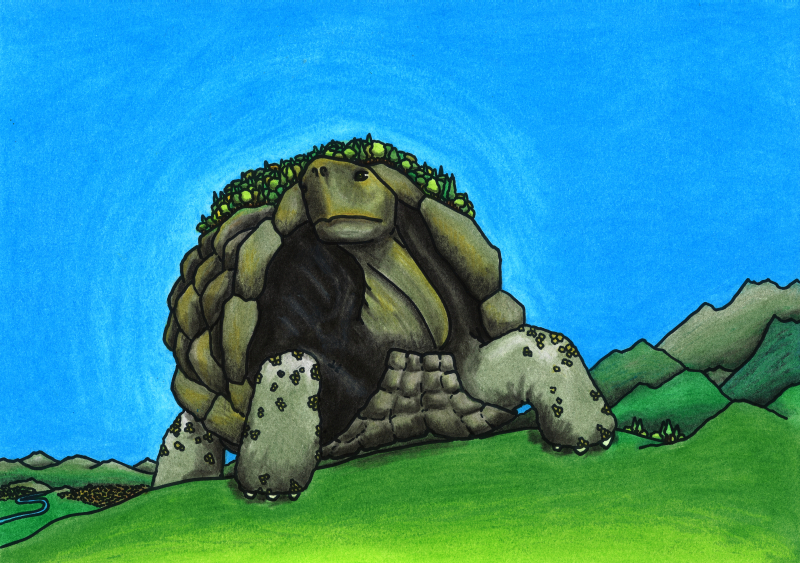 It was one such people who mistook the turtle for a hill; but to them it was not any hill. It was from the trees that grew on the Chelonian Hill that they built their first houses, and from the same trees that they cut the spears with which they subjugated their enemies. And so they saw this Great Hill as the foundation of their power, and to celebrate the day of his birth each man would stand in a mighty hall and raise his cup to the the immovable rock upon which the empire would stand forever. Meanwhile, the turtle slept. From its own perspective, scholars tell us, it was only a brief nap. When the turtle awoke, the great empire that had grown on its back was long forgotten, its place taken by another forest. Only in the traditions of those who had once been conquered did any trace of its history remain. Long after the turtle had awoken and continued its journey, to create another thousand legends across the world, people still raised their cups to the Chelonian Hill. And in that lies the unintended wisdom of the tradition. For whatever was the greatness of that empire, whatever were its crimes – what are they now but a brief interlude in the journey of that immense creature? And what are we, who are not even empires? Sing now, and dance, and speak until the stars are bright. Drink deep from the cup of life, for the hills are alive and the world will move beyond us. This entry in the Oneiropolis Compendium was made possible by Jeff Roberts.